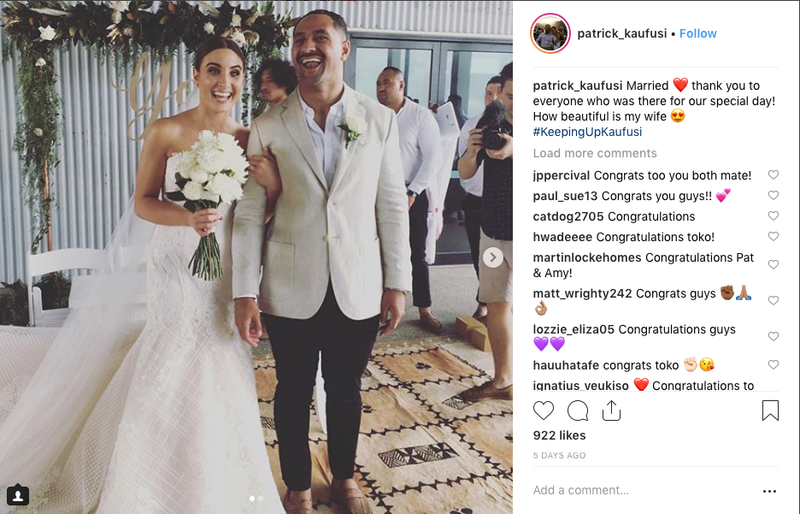 Amy Hendle married Melbourne Storm NRL player, Patrick Kaufusi in October 2018. Amy wore the Caryn gown by Australian designer to the stars, Helen Constance. The ivory coloured embroidery lace gown is detailed with champagne lining. She bought her HC gown from bridal retailer - Raffaele Ciuca, Melbourne. Patrick Kaufusi is a Tongan international rugby league footballer who plays for the Melbourne Storm in the National Rugby League (Wikipedia). We wish them a lifetime of happiness. Photo excerpt of the happy couple from their wedding day from Patrick Kaufusi’s Instagram.